You will not find a sweeter couple than Courtney and Zandy. They met at a neighborhood bar and hit if off. While on vacation in Paris to see the Tour de France they got engaged on their last night on vacation. They were both SO EXCITED. They chose Bay 7 because of their love of downtown Durham. Having walked by Bay 7 multiple times on date nights, they always dreamed of getting married there. The brick and vintage feel of the building was the perfect backdrop for this incredible Fall themed wedding, full of awesome details…Pumpkins, southern food, NC beers (Zandy is a bit of a beer enthusiast), beer pong, connect 4, jenga, a caricature artist, an old fashioned soda fountain, late night pizza from mellow mushroom, rubber ducks in the fountain, personalized wedding toppers of bride and groom, amazing florals, mad libs rsvp cards, and their adorable pugs made a special entrance in the ceremony. 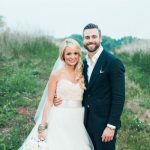 This wedding had it all and we absolutely loved every detail! Kevin and Daniel did a great job capturing this awesome story! The video is quality is unbelievable. Toni and Chris are extremely talented. 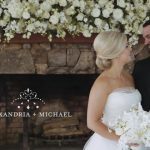 Our video not only captured the wedding, but it also told the story of us in the most beautiful, intimate and authentic way. This is money well spent. If budget is a factor, I would highly encourage cutting costs in other places – this is not the place to cut costs! 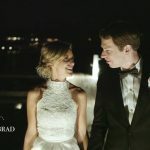 The wedding day goes by so fast and it is amazing to have a video to relive all of the details through. Toni and Chris have truly given us a gift that will be forever cherished. What an amazing couple and an awesome reception! Another great film guys! Thanks! You killed it as usual!